Ernesto Gomez grew up in Detroit. In 1988 he joined the U.S. Army thinking that nothing of lasting consequence would occur during his time in the military. Imagine his surprise when he found himself standing guard as the Berlin Wall fell in 1990. And as if the crumbling of the Soviet Union weren’t epic enough, he was called into the First Gulf War the following year. Gomez may have gotten more than he bargained for, but he met the challenge and served his country with honor for four years. What then? Like most veterans, he returned home and got down to the process of returning to civilian life. As we reported in our recent post, Negative Stereotypes Hamper Veterans’ Employment Opportunities that’s not always easy for veterans to do. Fortunately, Ernesto found help from the United Auto Workers (UAW) and the Ford Motor Company. The two organizations are working together to provide welding training to military veterans at the UAW-Ford Technical Training Center in Lincoln Park, Michigan. Gomez was one of the first eight veterans chosen to participate in the program. Some of the eight initial veterans had suffered a disability in the service. Others, like Ernesto, were facing financial crisis. Regardless of the reason, they were all struggling to secure jobs. Although Ernesto went into the program with no prior welding experience, he found that the skills he acquired in the military allowed him to easily transition into the trade. “My fellow veterans and I were able to apply the determination, discipline and attention to detail that we learned in the Armed Forces when we were offered the opportunity by the UAW and Ford to learn, and earn our certificates in, welding,” Ernesto said. 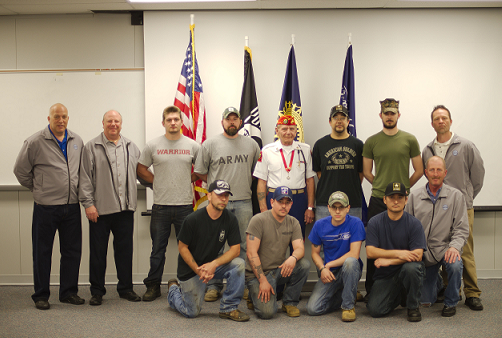 The first class of the Veterans Welding Program, including administrators, instructors, and students. Ernesto is kneeling second from the right. Ernesto was impressed by the course. “Everything was so professionally well planned and properly equipped. They spared no expense when it came to our education and also provided us with all the equipment a welder requires to exercise his trade.” The veterans were taught safety and blueprint reading along with welding proficiency in the classroom. As of the date of this article was published, Ernesto is well on his way to doing just that. He and a few other vet graduates from the Ford-UAW/Wounded Warriors welding program are working at the Ford Woodhaven Stamping Plant Motor Company. They expect to join the skilled trades department as soon as they begin to accept new welders and then start working on their journeyman’s card. The course is six weeks long. If you’d like more information about enrolling, visit the Wounded Warriors Veterans Welding Training Program web page. Join us next week when we take an even closer look at the efforts of UAW-Ford’s outreach and training program, including the work they do with Wounded Warriors Family Support to reach out to disabled veterans. Until then, we invite you to visit our website at American Welding Online, where you can find online courses, virtual conferences, and other digital tools to help you further your welding career.